“Basketball-crazed?” Yeah, but … Of course Indianapolans love their basketball, especially when the Pacers, Fever, Bulldogs, Hoosiers, or Boilermakers are winning. But you only have to be in the city for about two minutes to realize that nowadays we’re a football town—more precisely, a Colts town. The nickname “Indianoplace” is sooo 30 years ago. Seriously.“Naptown” is making a comeback, of sorts, but Clinton must have been the first person in at least a decade to use “Indianoplace” unironically. She dated herself big-time. Notice she didn’t take a swipe at Carmel. And for good reason. Just this past June, she made a stop in the north-of-Indy suburb to attend a fundraiser hosted by wealthy socialite Cindy Simon Skjodt. Hubby Bill stumped for Hillary at Carmel High School in 2008. 1. Milktooth. One of IM’s Best New Restaurants for 2015, the hip little Fletcher Place diner and brunch spot recently made Bon Apetit’s annual Hot 10 list. 2. 8 Fifteen. The finds at this Broad Ripple boutique might run a little edgy for a woman of Clinton’s station, but hey, should could always pick up something cute for Chelsea. 3. Eiteljorg Museum of American Indians and Western Art. One of Indy’s most surprising—and impressive—cultural institutions, it has amassed perhaps the best collection of contemporary Native American art in the nation, and continues to strengthen it annually by acquiring new pieces from top artists who participate in the museum’s fellowship program. 4. Cake Bake Shop. To quote IM assistant editor Taylor Ellis: “In the darling Cake Bake Shop in Broad Ripple, you will feel as though you’ve walked into a patisserie off the Champs-Elysees.” Owner Gwendolyn Rogers has earned distinction at London’s Cake and Bake Show, which led to an order from Elton John. 5. Black Acre Brewing Company. Named the number-one Best New Brewery in Central Indiana by IM last year, it’s an industrial-cool destination for beer geeks and the centerpiece of Irvington, one of Indy’s hottest neighborhoods. 6. Plat 99 in The Alexander. In Indy’s striking, art-laden boutique hotel, the only thing more attractive than the swank lounge’s downtown views and blown-glass light fixtures are its inventive, skillfully crafted cocktails. 7. Le Meridien. The historic Canterbury hotel, with a completely modern, elegant makeover. 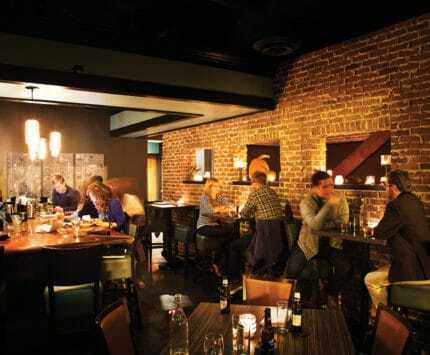 Even if Clinton doesn’t book a stay, she’ll want to stop for a nip and/or nosh at the onsite Spoke & Steele, one of IM’s Best New Restaurants for 2015.